This easy winter salad recipe is a deliciously different way to use leftover baked ham. 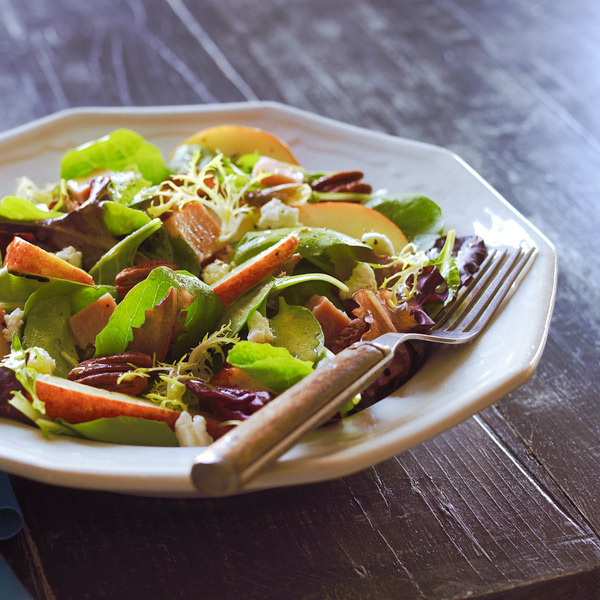 Just toss together fresh field greens with chopped ham, toasted pecans and red Bartlett pears and then drizzle with our homemade honey-mustard vinaigrette and top with crumbled goat cheese. The result: a nutritious, colorful side dish or entree for a quick weeknight dinner. Meanwhile, in large bowl, whisk together Dijon mustard, honey, lime juice, olive oil, salt and pepper. Add toasted pecans, ham, pears and greens, and toss to combine. Serve with cheese scattered on top.